1. Preheat the oven to 190°C, gas mark 5. Heat 1 tablespoon of the oil in a large frying pan and fry the chicken on all sides until browned. Transfer to a large flameproof casserole dish or deep-sided roasting tin. 2. Add the remaining oil to the frying pan and fry the onion and celery for 5 minutes until softened. Stir in the garlic, chilli, ginger, cumin and turmeric, and fry for a further minute. Add the coconut milk, stock and fish sauce, and bring to a simmer, stirring. Carefully pour the mixture over the chicken and cover tightly with a lid or foil. Transfer to the oven and bake for 1½ hours or until the chicken is tender and cooked through with no pink meat. 3. Lift the chicken out onto a board, cover with foil and leave to stand in a warm place. Add the salad onions and noodles to the casserole, and place on the hob over a low heat. Stir until the noodles start to soften. Tip in the spinach and mix in until it’s wilted. Cook gently for a couple of minutes until everything is hot. 4. 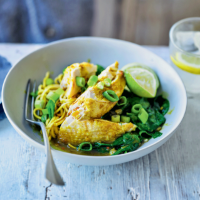 Carve the chicken and serve in shallow dishes with the spinach noodles and lime wedges to squeeze over.